We are proud to be a part of Saint Charles because of the heritage and the history it holds. If you are tired of the malls, musak and mass-produced items, Main Street is for you. Main Street is a place to escape from the crowds and relax to friendly smiles, carriage rides, great shopping and fabulous food. With more than 100 unique shops and restaurants, there is sure to be something for everyone. You’ll want to come back again and again to see it all. 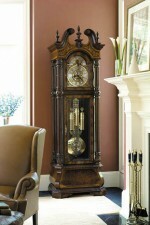 And you don’t have to worry about your purchase from Jansens, we’ll hold your clock for you while you shop! In fact, we offer free delivery and set-up in the St. Louis Metropolitan Area. For more information about Saint Charles, visit Greater Saint Charles Convention and Visitors Bureau for a list of stores, as well as information about local hotels and restaurants. First Capitol Trading – Great selection of collectibles and gifts such as Lladro and Swarovski Crystal. J Noto Italian Bakery – They make the some of the best cakes around, and we use them anytime we have a special event! Main Street Books – A very nice independent bookseller.